"Clark has perfected the suspense novel." 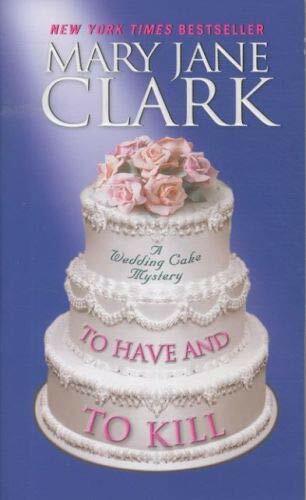 New York Times bestselling author and mystery writer par excellence, Mary Jane Clark kicks off her delicious new Wedding Cake mystery series with To Have and To Kill. A tasty departure from her thrillers featuring KEY News television anchor Eliza Blake (Dying for Mercy, It Only Takes a Moment), To Have and To Kill introduces readers to actress-turned-wedding cake decorator Piper Donovan, who discovers that the heat in the pastry kitchen can be hotter--and deadlier--that she ever imagined...and that her creative new enterprise is anything but a piece of cake. Foodies and fans of cable TV's Amazing Wedding Cakes, as well as Faye Kellerman, Jayne Anne Krentz, and Diana Mott Davidson readers are going to eat this one up! She understands how to hang on to her audience. Her characters are the sorts with whom many readers identify. --USA Today"
Piper Donovan never imagineddecorating wedding cakes could beso dangerous! A struggling actress with no immediateprospects and a recently broken engagement, Piper needs to take stock of her life--so she moves back home with her parents in New Jersey and steps tentatively into the family bakery business. Soon, she's creating a wedding cake for a friend, the star of a daytime television drama. But someone is ruthlessly determined that this wedding will never happen. It begins with the horrific murder of the bride-to-be's co-star--but a psychopathic wedding-crasher isn't about to stop there. Before Piper knows it, she's joining forces with FBI agent Jack Lombardi--a handsome neighbor with a soft spot for the inquisitive cake-maker--to sift through the suspects and find a killer. But Piper's about to discover that it may be a lot hotter in the kitchen than she's able to handle . . . There is something for every reader in To Have and to Kill.